Brave smart and strong..... my amazing son. And a rant about funding cuts. 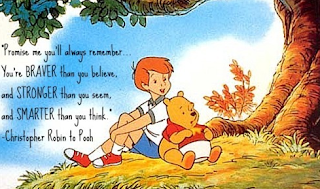 I believe it was Christopher Robin who said you are braver than you believe, stronger than you seem and smarter than you think. Well, technically, it would have been A.A. Milne who said it, I guess. 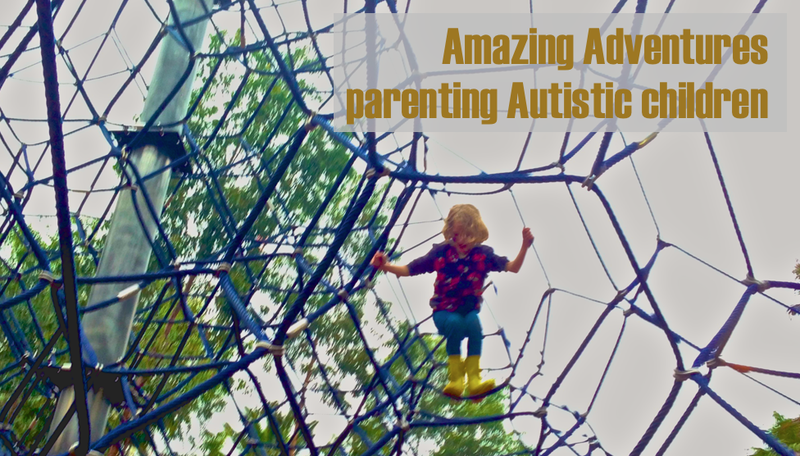 One thing that strikes me about my Autistic kids is how resilient they are. And how clever. I'll explain. I go through the day and I process sounds, sights, smells and sensations. I interact with people appropriately. I plan and carry out tasks. I get from one place to another. I smile and laugh or look serious at the right moments (mostly). At the end of the day I am tired from doing all this. My Autistic kids do the same things. The difference is that they do it all having learned by rote all the social cues and correct responses. They do it all from in the middle of dealing with a sensory system that interprets everything much more intensely- lights are brighter, sounds are louder, touch is painful. That has to be exhausting! Every time they master skills they get busy using them well in their everyday lives, and then at some stage the rules change. They grow a bit older, and require a new set of more complex skills that they must rote learn and implement. Some stages have a few new skills to acquire, some have lots! This past year has been a stage with heaps of new skills for my 13 year old Autistic boy to learn, as he started in Year 7 at High School this year, in a mainstream class. We did as much preparation as we could before hand, and off he went. Sadly, it is true that kids on the Autistic Spectrum are much more likely to be bullied than their peers (46% compared to 11%). This has proved to be the biggest issue my son has faced this year. We had him prepared to navigate hallways, deal with 7 teachers, able to cope with a daily timetable that changed over a fortnightly rotation, ready to plan out and manage assessment tasks. We have started teaching him more complex, adult style social cues and responses. What we couldn't get him ready for was having his lunch box stolen, being shoved in the hallways, being called rude names, having money demanded of him by other students, having his school bag urinated on and having his mobile phone stolen. We supported him through all of these things, with the help of our Psychologist and with the co-operation of the school. Half way through the year the NSW Government took away his individually allocated support funding (click here to read my Open Letter to NSW Politicians expressing my concerns about the Every Student Every School Policy), and he lost time with the Teachers Aide who had been working with him. Things had been hard, but manageable before that. After the funding cut, things got very hard. Both my Hubby and I, and our sons teachers could see he was not coping as well socially. Amazingly though, even with all the stress he was experiencing, my Brave, Strong, Smart son managed to achieve so well academically that the school has suggested he would be suitable for placement in a class for Gifted and Talented students next year. The suggestion was made as a way to support him better academically as well as socially, as the group of students he will be placed with are highly motivated to learn and much more of a predictable and mature social group. Not only am I encouraged by the schools willingness to do this for my son, I am sure that it is the more suitable, more supportive environment my son needs to gain back his enjoyment of school and his interest in learning. And I am immensely proud of him! He never fails to rise to the challenges set before him, despite the extra difficulties he has to work through. Seeing him do that is one of my favourite parts of the journey of parenting Autistic children. The rant part of this post is that the NSW Government should count themselves lucky that they are in the fortunate position of having staff working in their schools who are so committed to seeing kids with additional needs well support regardless of how much resources are stripped away from them. In our family we have already seen the trickle down effect the funding cuts are having. We feel very relieved that the schools our children attend are willing to work with us to make sure our kids get what they need despite having significantly reduced funding to work with. It angers me that the people who made the decision to take away the money that provides that support will never know what the real cost of their decision is and will continue to be. But lets finish on a positive note. My son is amazing! He has worked hard. He has dealt with things he never thought he could. He has grown. He has persisted. He has achieved well. We are now winding down for the year, having a few days off here and there, even though school is officially still on. Soon we will have a nice long break from school. Next year is a new start in a more supportive environment. I am sure we are going to see more great things form him next year. If he could do so well this year, with all the extra awful things he's had to deal with, imagine how much more he will achieve with many of those stressors removed. I am one very proud mum! Half way through term four. Five weeks to go until a nice long break. Of course, they are the busy last weeks before Christmas where all the end of school year concerts and presentation ceremonies happen. And by the time all the members of our family are covered I’ve got what feels like a million other appointments to go to as well..... Kindergarten Orientation, High School Orientation, Ante-natal clinics, Doctor, Psychologist, Psychiatrist, Physiotherapy..... It’s no wonder I’m feeling a bit overwhelmed. I can see that MasterL is feeling overwhelmed too. I know this from observing his behaviour. I also know this because he has told me numerous times in the past week that he doesn’t want to go to school anymore. When I ask him why not he can’t tell me. When I ask him if something bad is happening at school he says not really. He just doesn’t want to be there anymore. He has stopped even trying to manage being in the playground at lunch time, preferring to take himself to the Support Unit to sit quietly with other kids who struggle in the same way he does. I’m not that worried about him choosing this coping strategy- it shows a good deal of maturity in many ways, in that he can see for himself that he needs a break and knows how to get it appropriately. I’m proud of him for that. I am disappointed, however, that he feels he needs to do that. To me it says that the cut in funding has led to a reduced level of support which only provides for L’s academic support and no longer for his social support needs. I have spoken to the school about this, and they have told me they can organise an assessment to see if they can attract any more funding to help him individually, but it really is a long shot. The new system doesn’t allow for kids who aren’t showing difficult behaviours to get individual funding (and he isn’t showing difficult behaviours at school....yet) and the money they have in the general pool is already being stretched too far. It’s frustrating to be able to see the trickle down effect of the funding cuts starting, but still not being able to do anything about it until it gets worse. He already is struggling with going to school, and I can see his behaviour at home showing this. He expresses reluctance to go, and is having trouble completing homework tasks, yet because he looks ”OK” at school there is unlikely to be any support available. It brings up the question again for me.... why is what my son needs less important than what other children need? Any other U2 fans out there? The song "Some days are better than others" has been going through my mind lately. Things have been.........hectic.........here lately. I've had a few teary days, coming to terms with some new things in our family. I've had a lot of busy days attending appointments, making phone calls, organising "stuff". We are OK, but new challenges are tiring and time consuming. Anyway, I'm just stopping in briefly to let you know that soon I will get to writing some updates on School Transition, and Funding Issues for those of you who are interested. After that I'll try for a more general kind of post. In the mean time you can read my most recent contribution on the Aussie Mum Network website by clicking here. If you want to check in for general updates you can have a look at my Facebook page.